Dean admits there won’t be a brown gum tree in sight. “I love to experiment with colour and design,” she says. 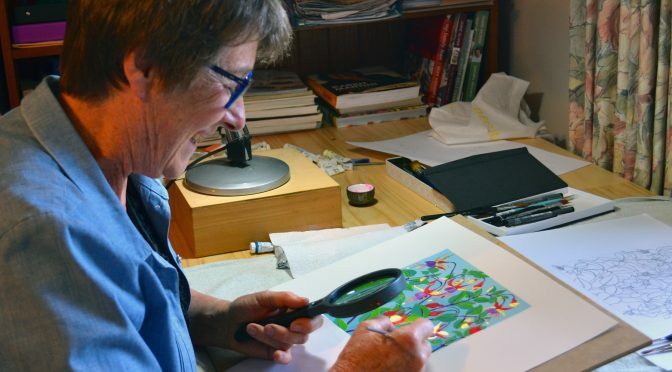 “At the moment I am working with gouache and gold leaf extensively for this latest exhibition. The exhibition is the result of an off-chance meeting with Miloko owner Bernadette McDermott, when Dean dropped into the artisan store one day. As with any artist, Dean’s experience has informed her art. A large part of her life has been her career as an English teacher. A serendipitous moment for Dean was when she returned from the United Arab Emirates in 2010 to live in Geelong. “Soon after I arrived I went to a Plant Sale in the Botanical Gardens,” explains Dean. Dean does not consider herself a botanical artist, but continues to explore and work with this subject as it gives her immense pleasure. The Gilded exhibition is at Miloko, 372 Mt Dandenong-Tourist Rd, Sassafras, from July 22 to August 31. Story by Karen Tayleur, as published in the Winter 2017 edition of Yarra Valley & Ranges Country Life magazine. Buy a copy here.